Floral landscapes reached their zenith in the 18th century. In the hands of the skilled weavers of Oudenaarde, the landscapes were simply stunning and without equal. In “Landscape with flowers”, you can see the superb work of these artisans of Belgium. The detail, the colors and the composition are simply fantastic. The vibrant woods contrast wonderfully with the more muted mountains in the background. A meandering stream connects them visually as it weaves through the forest and into the meadow beyond. The lively color scheme gives the feeling that it’s late summer or early fall, as the trees begin to turn color. The outer border has a rich floral pattern as well that complements the main work. 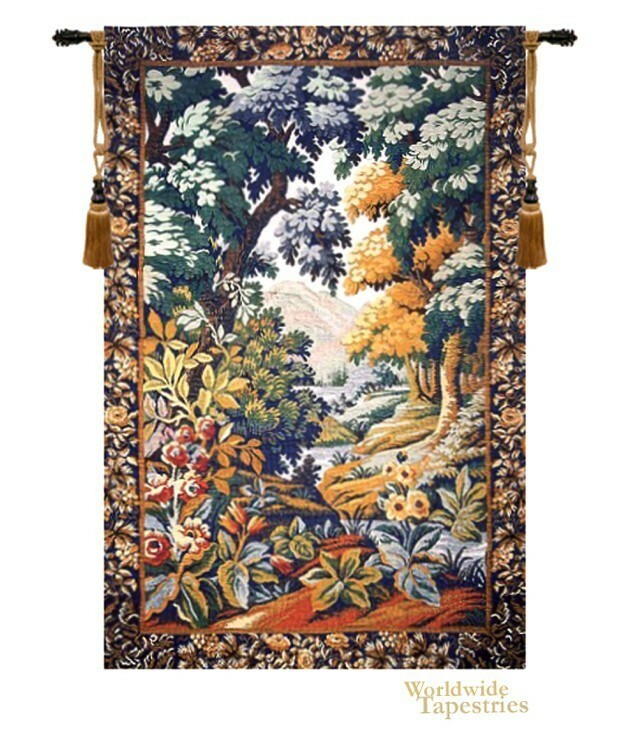 This tapestry "Landscape with flowers" is lined and has a tunnel for easy hanging. Note: tapestry rod and tassels, where pictured, are purchased separately. Dimensions: W 50" x H 75"